Summer is here and the kids are ready to play! Getting outside with the kids and in the fresh air is a great way to enjoy summer days. Put the video games on pause and get outside. 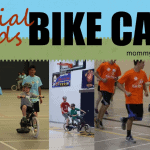 There are so many fun bike paths that are great for kids. We live in a neighborhood with a lot of hills and so it makes it hard to go on family bike rides. 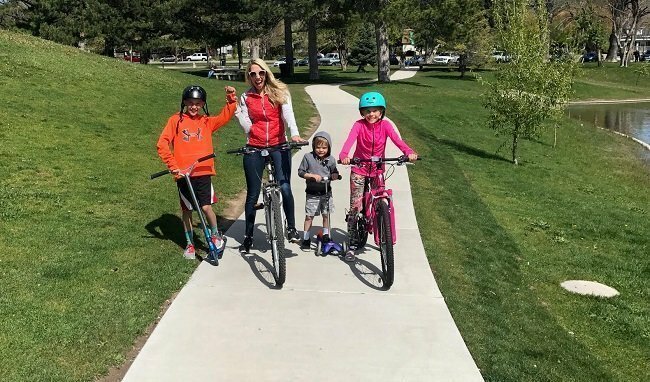 So, we throw the bikes and scooters in the back of our car or truck and head over to these fun paths! These trails are fun for the whole family and safe for the little ones. 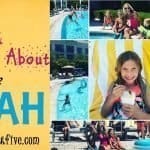 It’s a great way to enjoy the sunshine and get some bonding time with your kids. They can stretch their legs and have a great distance to ride instead of just circling the culdesac. Mom’s happy and the little ones and big kids love it. 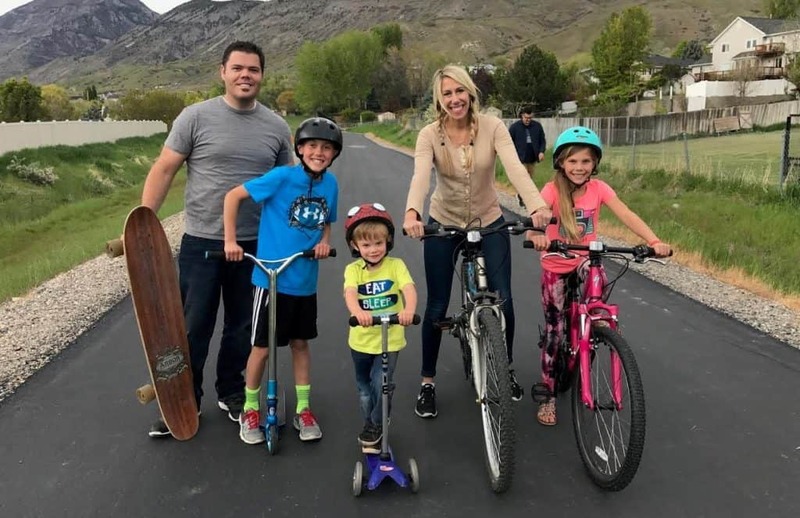 Grab your helmet, pump your bike tires and get out there and enjoy these great bike paths in Utah. This trail is 50 miles long and follows the Jordan River. It stretches in 3 different counties; Utah, Salt Lake, and Davis. It has over 23 trail heads that you can enter the bike path. 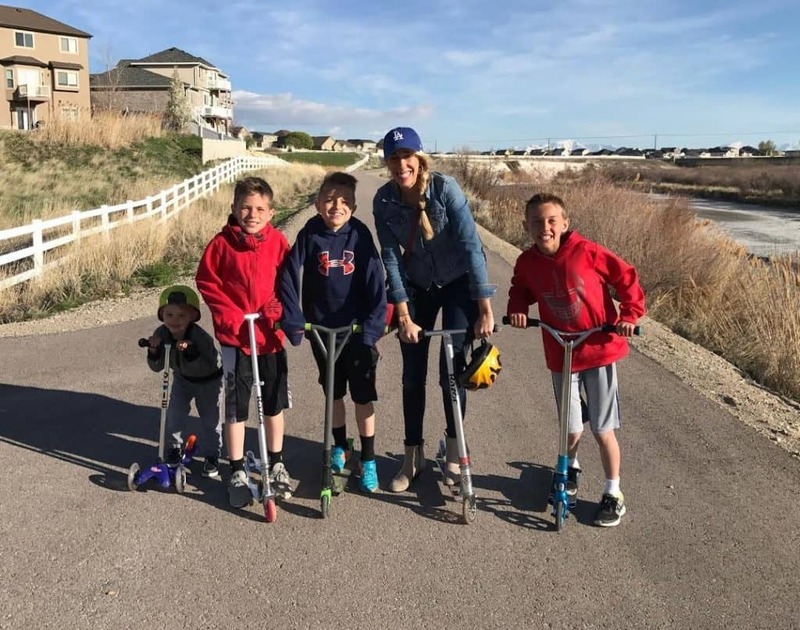 I took the kids to the trail head in Lehi by Thanksgiving point. It is absolutely beautiful. The path feels like your in the country and is a little more isolated. It does have a playground and bathrooms at this trailhead. 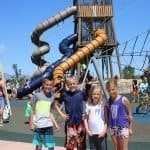 Jordan River has the perfect distance for kids. It feels great to just ride as long as the little ones can and then turn around. So, look up this Bike trail and find the closest trail head to you and have some fun. Liberty Park is in downtown Salt Lake City and is such a great park for kids. It has lots of areas to sit and have picnics and play lawn games with its large shade trees. It has the cutest lake to feed the ducks, a splash pad in the summer, playground, and a great bike path that goes around the park. This park is so fun and perfect to ride together with the kids. It has the cutest bridge and offers tons of fun while going on a family bike ride. The path is about a mile long around the lake. The address is 600 E 900 S. This is a great area to take the kids, enjoy the park, and go for a great bike ride. 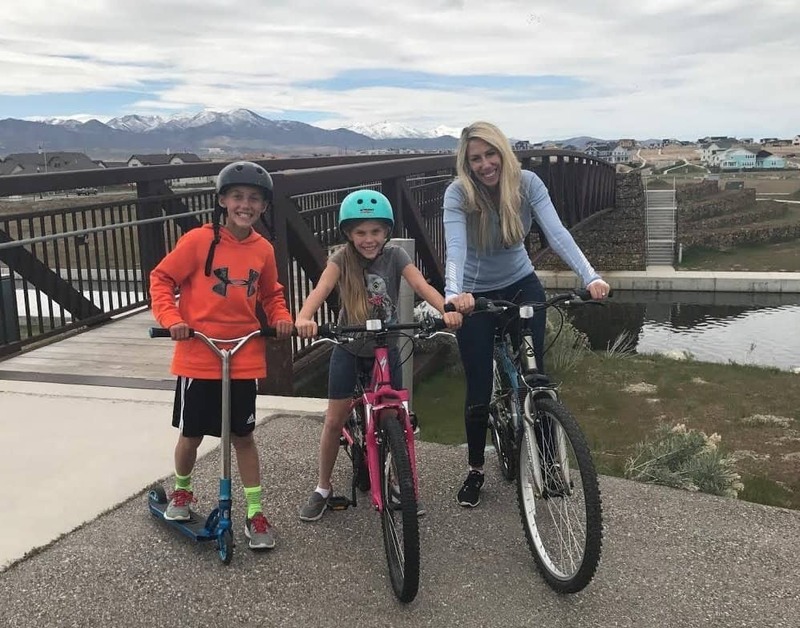 The Daybreak community in South Jordan Utah offers one of the best bike trails for kids around. There are several bike paths in the Daybreak community and they offer over 40 miles of trail. The DayBreak Bike Path is a beautiful kid friendly bike path circles the lake and provides great views. It’s easy to keep an eye on your kids. It does have the cutest bridges and you can bike over them and you can bike to the island and around. You can stop and feed ducks and enjoy the beautiful surroundings. The path around the lake is 3.5 miles around. This is a great area to take your kids for a fun bike ride. The Draper City Park has a bike path that loops the park. It does have a couple breaks in the cement, however, which is harder for scooters. Right there is a trailhead to Willow Creek Trail and it is perfect for kids. It’s nice and short and easy to head out and turn around. The path stays flat and you can see your kids the whole time. It has a little creek to stop and throw rocks or feed the ducks. The path is nice a smooth and my kids loved it. Also right there across the street is the Porter Rockwell Trail, which is better for bigger kids and has a few hills. When you get tired of riding you can have fun at the Awesome Draper City Park. This is an absolutely perfect trail. It is pretty new and was built in 2013. It is nice and smooth and a great bike path for kids. We entered the trail head in Lindon. The Murdock Canal Trail is 17 miles in length and of course easy to go out and turn around and head back to the car. The views are beautiful!! It is built over the now enclosed canal. The trail connects seven communities in Utah Valley and is marked every quarter mile with bathrooms every 3 miles. We entered the trail at Lindon 300 N 780 E. This was a family favorite and the kids loved this one. Other trailheads are in Orem, Lindon, Plesant Grove, Highland, and Lehi. The width of the trails is perfect and has plenty of room for everyone. 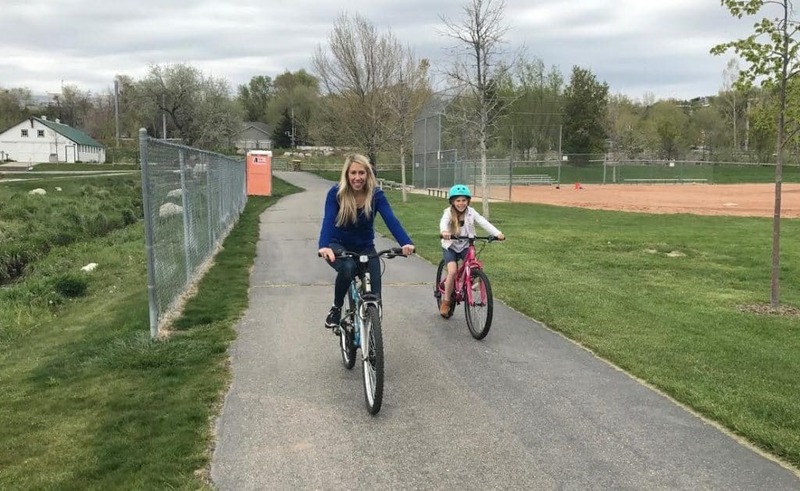 Have a question about one of these bike paths in Utah? Be sure to leave me a comment!